FIGURE 10.29. The stellate crease is frequently found directly superior to the acetabular fossa (AF) characterized by a stellate pattern of chondromalacia (arrows). This appears to be a normally occurring process, even in young adults, without clear prognostic significance. rent methods of acetabular labral repair are in their infancy. A few such repairs have been attempted with mixed results. Reliable techniques remain to be developed but are probably not far off. In addition to technical advancements, there is much that remains regarding our understanding of labral morphology and pathophysiology. Considerable variation exists in the normal appearance of the labrum including a labral cleft at the articular labral junction, which can be quite large.12 It is important to distinguish this from a traumatic detachment, which can also occur. Additionally, many labral tears, even in the presence of a significant history of injury, seem to occur due to some underlying predisposition or degeneration. 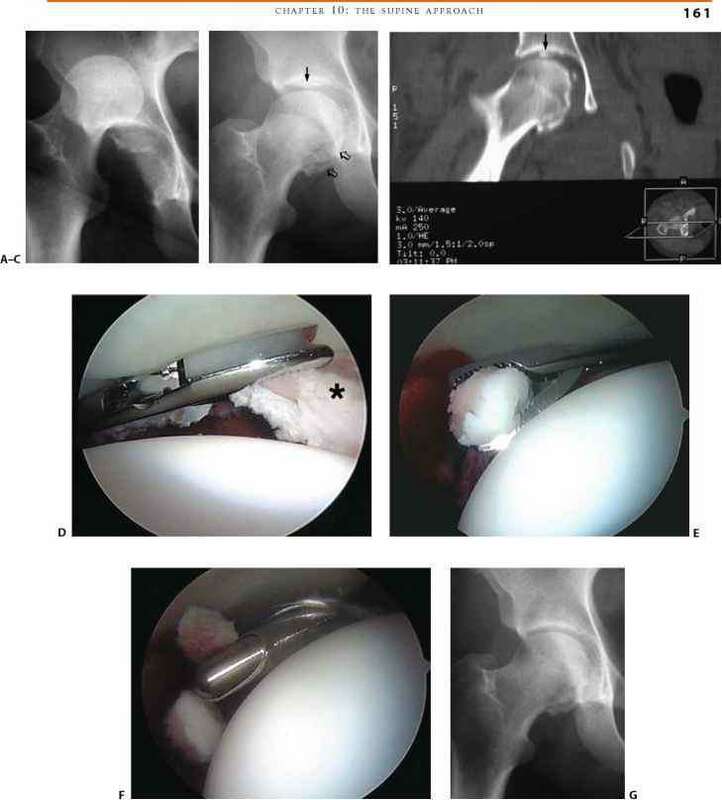 Under these circumstances, even with reliable techniques, repair of a degenerated or morphologically vulnerable labrum would be unlikely to be successful. A 20-year-old Division I collegiate hockey player was referred with a 2-year history of progressively worsening sharp stabbing mechanical right hip pain. Magnetic resonance imaging (MRI) revealed evidence of labral pathology (Figure 10.31A). 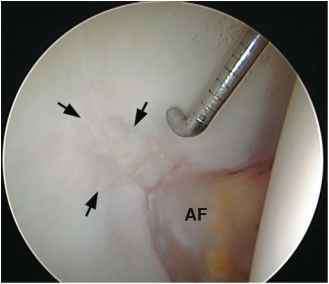 Arthroscopy revealed the extent of damage, which was debrided with marked symptomatic improvement (Figure 10.31B,C). Chondroplasty can be effectively performed for lesions of both the acetabular and femoral surfaces. Curved shaver blades are helpful for negotiating the con straints created by the convex surface of the femoral head. Due to limitations of maneuverability, thermal devices have again been especially helpful in ablating unstable fragments. However, cautious and judicious use around articular surface is even more important because of potential injury to surviving chondrocytes. Microfracture of select grade IV articular lesions has been beneficial.17 As with other joints, microfracture is best indicated for focal lesions with healthy surrounding articular surface. The lesion most amenable to this process is encountered in the lateral aspect of the acetabulum. Microfacture is followed by 8 to 10 weeks of protected weight bearing to neutralize the forces across the hip joint while emphasizing range of motion. Injury to the ligamentum teres is increasingly recognized as a source of hip pain. The disrupted fibers catch within the joint and can be quite sympto-matic.18'19 This disruption may be the result of trauma, degeneration, or a combination of both. The tear may be partial or complete, with the goal of treatment being to debride the entrapping, disrupted fibers. The acetabular attachment of the ligamentum teres is situated posteriorly at the inferior margin of the acetabular fossa and attaches on the femoral head at the fovea capitis. The disrupted portion of the ligament is avascular, but the fat pad and synovium contained in the superior portion of the fossa can be quite vascular. Debridement is facilitated by a complement of curved shaver blades and a thermal device. 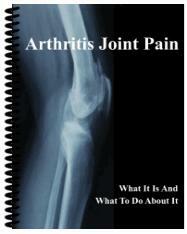 The disrupted portion of the ligament is unstable and delivered by suction into the shaver. A thermal device can also ablate tissue while maintaining hemostasis within the vascular pulvinar. FIGURE 10.30. A 16-year-old obese girl sustained an injury to her right hip. (A) AP radiograph demonstrates a posterior fracture dislocation. (B) Postreduction radiograph reveals a nonconcentric reduction with bone fragment entrapped within the weight-bearing portion of the joint (arrow) and minimally displaced fracture of the femoral head (open arrows). (C) Coronal computed tomography (CT) reconstruction further illustrates the largest entrapped fragment (arrow) within the joint. 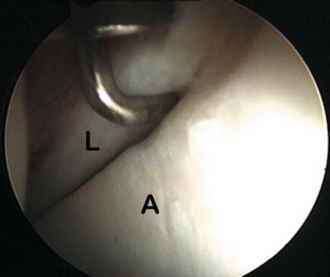 (D) Arthroscopic view from the anterolateral portal demonstrates the largest fragment (asterisk), which has been grasped with an instrument brought in from the posterolateral portal. (E) Now viewing from the posterolateral portal, fragments are identified within the acetabular fossa. One is retrieved with a grasper. (F) Smaller fragments are debrided with a full-radius resector. (G) Postoperative radiograph demonstrates a concentric reduction, and the inferior femoral head fragment remains in place.